It is the end of "Food Week." Don't worry! There will still be an interview with Cerella Sechrist, author of Love Finds You in Hershey, Pennsylvania. You just have longer to anticipate it! We can have a food flashback when I post it. Is your mouth watering yet? I'm gearing up to say a sad goodbye to Corban University for four months. It's a good thing I'm coming back next year or I would probably be sobbing right now! So far I have had a great college experience, and I have made such amazing friends. I am so blessed! Thanks to Novela (in the green) for sending me this picture! (I'm in the back in the red shirt.) I love these girls so much! Well, I'm in for a weekend full of stuffing boxes into our van, saying goodbyes, and traveling. But I'm also having "girl time" with my mom (including shopping and eating out), so that will be tons of fun! I guess there has to be a balance between the happy times and the sad times. But through it all God is good, and while I'm going back to my earthly home soon, I'm overjoyed to know that through God's grace I have a home in heaven that is my true home! What a homecoming that will be! I was introduced to Owl City this year at college, and I'm really liking this artist's music. Hope you enjoy the song--it's kind of a different type of music, so it may not be for everyone. But I really like it, so I hope you do, too! Well, how about you? Do you have any fun songs about food (or songs that at least mention food) that you would like to share with us? I'm interrupting "Food Week" to shout out a big thanks to Ashley at "After All....... Tomorrow Is Another Day" (http://anotherdayforhim.blogspot.com/) for giving me my very first blog award! I'm honored. From Ashley's blog: "This award is traditionally passed on to those blogger's that inspire others and show positivity and creativity, so, in that spirit, I picked my nominees from blogs that I visit regularly and are very informative and inspiring to me." I'm sure there are many more blogs that deserve this, but these are just some of the blogs that bring sunshine to my day! Thank you! If any of the owners of these blogs would like to pass on the award, the rules are posted on Ashley's blog (see link above). Side Note: I had my last final today, so it is officially summer break for me! I'm still here at school, but my mom is coming tomorrow and we'll drive back down to California on Sunday. I'll miss all my college friends so much!!! But I am excited to see my family and friends from home again! 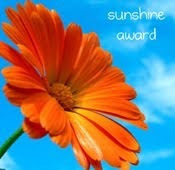 So, this Sunshine Award is a great way to commemorate my completion of my first year of college! How is everyone else doing this lovely day? I'm giving away a $10 gift card to Walmart to one lucky person! I thought a Walmart gift card would be appealing to everyone, and not only can it be used to buy food or cookware, but it can be used to fuel any appetite (even an appetite for reading). One entry can be gained by leaving a comment on this post about some food-related memory. Two more entries can be gained by following this blog (either becoming a new follower or letting me know you are already a follower). Three more entries can be gained by sharing a recipe with all of us in your comment! You must have a U.S. address. You must leave your e-mail address in your comment. Entries will be accepted through Friday, May 7. A winner will be drawn on Saturday, May 8. Best of luck to you all! One of the most interesting shows to watch on Food Network (at least for me) is the "Food Network Challenge." Mostly, I LOVE seeing the amazing cakes that people can create (nothing like mine; just read my previous post!). Apparently there is a new host for this show (I haven't been watching much TV recently, so I'm a bit behind the times), so I'll have to check it out and see what I think now! I also enjoy watching "Good Eats," the show hosted by Alton Brown. He is full of the most interesting and random bits of information, and he is so funny! He is a great TV show host, in my opinion (and I know at least one of my followers would agree--*cough* Ariel!). Not only does he host "Good Eats," but Alton Brown also hosts "Iron Chef America." Another competition show, "Iron Chef America" is exciting to watch. I envy their amazing cooking abilities, of which I am sorely lacking! And this summer marks the 6th season of "The Next Food Network Star," which is Food Network's version of reality TV. Only 40 days until the season premiere! Now, I could go on and on about other food-related shows or movies, but I'm curious to hear what ya'll think (as Paula Deen might say!). What are your favorite food shows and/or movies? And don't forget to come back soon to read an interview with author Cerella Sechrist, who will also share her response to this question! So please come back and visit often this week! Your comments and participation are what will make this week fun! To get the fun started, I'll share my sad food story: Last semester I wanted to help bake a cake for my friend's birthday. But there weren't that many dishes left in the second floor kitchen, and I didn't realize my roommate had a one-time-use cake pan, so I thought I could bake the cake in a loaf pan. BAD IDEA! See the cheesecake pictured on the right? Thank you, Walmart, for saving the day! I hope everyone is having a fun-filled Saturday! Mary Poppins is such a great movie, as are many of the Disney movies! What are some of your favorite Disney movies? Instead of writing about my hometown (which isn't really existent, since I live inbetween towns), I thought I'd share a bit about my home county. Why my sudden interest in my home county, you may ask? Well, today was my last day of classes, and in about a week I'll be headed home! While I will miss my "third home" (as my grandma and I fondly refer to Corban University), I'm very excited to go home and see my family again! And who doesn't love summer vacation? My home county is Humboldt County, located on the beautiful North Coast of California. The weather: Oh, boy . . . this isn't exactly the best part about my home county! Fog can be rather mysterious and lovely, but it can also be rather cold. Temperatures are about the same all year round (especially right near the coast). It does warm up some in the summer, but days with the temperatures in the 60s and 70s (Fahrenheit) are considered good days (40s and 50s are most common). However, we do get some sunshine off and on, in-between the rain and fog! The scenery: This has got to be one of the best parts about Humboldt County! The scenery is absolutely breathtaking, what with the redwoods, the ocean, the meadows, the farmlands, etc. I could go on and on! But how about I just share some pictures, instead? Photo by Jack Hopkins: Courtesy Humboldt County CVB, redwoods.info. Photo by Carrie Grant: Courtesy Humboldt County CVB, redwoods.info. Photo by Don Forthuber: Courtesy Humboldt County CVB, redwoods.info. The people: Humboldt County is home to my family and many of my friends, so of course I love the people! The shops: Because of all of the fun places to see, there are lots of cute gift shops in Humboldt County (like "The Sea Around Us" in Trinidad and the cute stores in the Victorian village of Ferndale). Plus we do actually have a mall (The Bayshore Mall) in Eureka, which is a plus! The tourist traps: One of my favorite tourist traps is the Trees of Mystery (that might be a bit north of Humboldt County; I'm not sure). The beautiful redwoods, the tall statues of Paul Bunyan and his faithful sidekick Babe the Blue Ox...so fun! Anyway, do any of you have anything to share about your hometown/county? Well, dear readers, Tuesday afternoon was my time to weep. Perhaps not in as serious a context as this verse suggests, but I was still pretty upset. After setting up a short video clip, researching, writing my speech, putting it all together . . . it all fell apart. That's how it felt anyway. But I'm getting ahead of myself. I was the first one up to give my speech for my Fundamentals of Speech class. It was a persuasive speech on how people don't know self-defense, self-discipline, and self-respect and should therefore get involved in martial arts. As a black belt in Jujitsu, having trained for 13 years, I felt that it was something I could talk about that I knew pretty well. Anyway, my wonderful teacher gave me a great introduction, and then I was up. I knew I was in trouble right from the beginning, because instead of rattling off my introduction that I had attempted to memorize, I kept looking down at my outline (where I had written most of my speech word for word). I would not recommend this, because as soon as I got to my first main point, I started reading something that made absolutely no sense out of context! It's rather embarrassing getting ahead of yourself. So I had to backtrack to try and save face. But that's not even the worst of it. As soon as I got to the part where I was about to show the video clip my dad had spent a long time e-mailing to me (which I had put to music and everything), it didn't work. I clicked on it several times, and . . . nothing. Talking about a video clip is not the same thing as showing one, just in case you were wondering. I was disappointed in myself, and to be honest, I felt so stupid. After class I called my mom, and that's when I let myself cry. And I was sullen for a couple of hours after that (just ask my friends!). With all that said, I will now get to the point of this post. My sweet friend who lives in another dorm asked if she could come up and visit with me after dinner, and when she came to my room we started talking and I shared my story. Her visit brightened my spirits, and as we were talking the most beautiful sight appeared outside my window. Just take a look at some of the pictures my friend took, and you'll see what I mean. What a gift from God! But here comes the reason why I chose the title for my post. As we were talking, I was checking different blogs when I read the post for the Seekerville blog entitled She Said WHAT? I started laughing so much, and I shared it with my friend and she got a good laugh, too! The author of the post shared an experience where she had said the wrong word and felt so embarrassed (you'll simply have to read the post for yourself to get why it is so funny). Later on that evening, I talked with my dad on the phone, and I took a new look at what had happened in speech class. It was actually rather funny! That time when I got ahead of myself--let me give you the context. I had just told the class how they should get involved in martial arts and then I said, "If someone heard that the rate of car accidents had gone down, they would still take safety precautions like wearing there seat belts." Where on earth did that come from?! Well, I was supposed to say before that line that crime rate was going down, but we should still be smart and know how to defend ourselves because crime still happens. And what about the video? Well, my introduction to the video was: "If you do martial arts, you can be your own hero, just . . . like . . . me!" And . . . nothing. So much for being my own hero! I couldn't even remember to put the video file on my flash drive! If you've made it to this point in the post, thanks for taking the time to read my "novel"! I hope that this post is an encouragement to you, that maybe we can all learn to laugh at ourselves (it's hard--I know!). Or when times are hard and we just need to weep, remember that there will come a time to laugh. I had been rather prideful about my speech topic, feeling glad that I could surprise the class with something they would never expect about little old me. But I'm not perfect (not even close! ), and I think it was good to have this experience where I could learn to laugh at myself, even if it was painful at first. May we all take the time to enjoy a good laugh--it truly is some of the best medicine! Welcome Erin Healy! Thank you so much for joining us today! Amber: Since you co-wrote your first two novels with Ted Dekker, does Never Let You Go hold more meaning for you as it is technically your debut novel? Erin: I wouldn't say NLYG is more meaningful to me, but it does feel more personal. All the creative decisions in this story are mine, and it's my first step down the path of finding my own voice. If readers ultimately accept my stories apart from Ted's, then the validation will certainly be more meaningful. Amber: How did you first become interested in writing suspense novels? And what is the inspiration behind Never Let You Go? Erin: Suspenseful stories are the ones I've always been attracted to. They're what I like to read and watch. Merging this genre with spiritual sensibilities makes sense to my personality. The thematic inspiration behind NLYG arose from a relationship I observed between an unforgiving father and his adult son. The impact of bitterness from one generation to the other surprised me. Of course, this isn't the story NLYG tells, but my novel is the result of "translating" my spiritual observations into a fast-paced, suspenseful story where the stakes are high. Erin: "Stuck" characters are everywhere in Irish and British literature, aren't they? No, I don't see my characters as stuck in the way you describe. I see them as surprised to discover that life isn't as compartmentalized as we Americans tend to see it. I see them as growing because they come to a new awareness of life's breadth and the mysteries that span reality. Growth, in my philosophy, isn't about SEEING more than one side of a thing, but about learning to LIVE in the complexity of all the various aspects--this is something I deal with daily in my own life. Amber: Have any specific Irish authors/artists (ie: poets, musicians, etc.) influenced your writing? Erin: The poet Seamus Heaney has a way of seeing and saying that has always appealed with me. His perspective of how an individual's life interacts with the natural world is always so beautifully and profoundly put. I find his essays about voice and technique meaningful. He, too, has his feet in the dual worlds of Ireland and England, and the tensions emerge in his creative work. Although I can't say he's influenced my writing directly, he has influenced me emotionally. The musician Maire Brennan has a similar effect. Amber: I have to say, Angelo’s character reminded me a bit of Michael Landon’s character in Highway to Heaven (not in looks, though!). This leads me to a fun question: What are your favorite old (or modern) TV shows and/or movies? Erin: I never followed Highway to Heaven; I was more of a Little House on the Prairie girl! I'm very eclectic when it comes to what I like to watch. I loved the early seasons of Lost but put that behind me when they had to add subtitles to explain what was happening. (Who likes to work at watching TV?) I'm a fan of mysteries and crime dramas, everything from the original Law & Order to CSI: to the crazy-cozy Monk and the character-driven The Closer. My favorite movies are more contemplative, such as The Chosen, based on the book by Chaim Potok. People ask me these questions and I have a hard time coming up with answers, because it's hard for me to limit them to one sure thing. Amber: Can you share some of your upcoming plans for your writing? Will you be flying solo from now on, so to speak, or do you plan on writing some more stories with Ted Dekker? Erin: Ted and I had a third story planned, but that has been tabled for the time being so the two of us can focus on our solo careers. Maybe in the future we'll collaborate again, but for the time being, I'll be writing on my own. Thanks for taking the time to answer my questions! I really appreciate it! Readers, you can find Erin at: http://www.erinhealy.com/ And if you would like to read my review of Never Let You Go, just go to http://seasonsofhumility.blogspot.com/2010/04/my-review-of-never-let-you-go-by-erin.html or scroll down to the following post. For Lexi Solomon, life hasn’t been easy—but now it is about to careen out of control. With the return of her husband seeking a second chance, an evil man out to make her pay, and the man who killed her sister, Lexi’s life is falling apart. And the supernatural is taking a very real role in the crazy events going on in her life. Never Let You Go, while a suspenseful book, is a book with a powerful message about mercy and learning how to finally let go, although the process is long and painful. I have to say that while this isn’t normally the type of book I would read, I found the overall message of the book to be an important reminder for me. But this is the kind of book that requires time set aside to read it—it cannot be read only halfway. Never Let You Go is very intense and not the easiest to read. However, I’m so glad I finished it and saw how all of the elements of the story worked together! Never Let You Go is well-written and draws the reader into the world that Erin Healy has created. However, as I said before, this can be a hard book to read with very real and painful elements included in the story (ie: drugs, relational drama, etc.). But if you’re looking for a thrilling read that will leave you challenged, this book is for you! Clark from Love Comes Softly. I love how the actor portrays Clark in this movie. He is a man of compassion: a family man who is not afraid to go after the woman he loves! He knows when to give someone time alone to think or to grieve. And most importantly, he is a man of strong faith, who goes out on a hillside to sing to God and prays wholeheartedly. Mr. Knightley from Emma. (The movie version with Gwyneth Paltrow in it is my favorite so far.) What can I say? Who wouldn't want a hero who is your best friend? Isn't that where they say love should begin--as friends first? Well, Mr. Knightley is not only a great and handsome friend, but he is also a very honest one, who cares enough about Emma to tell her when she has messed up. And he is a great dancer (which is very important in my book)! And on the subject of Jane Austen heroes, Henry Tilney is now probably one of my all-time favorites! (I love the PBS version of Northanger Abbey.) Henry Tilney is such a fun person to be with--he teases, but he also shows honor and care. He rides horseback, dances, and is quiet up-to-date on the latest fashions! As for heroes from books, I'm sure I'm not the only one who cannot resist Michael Hosea from Redeeming Love (by Francine Rivers). How amazing is love that never gives up, that follows God's will! Michael Hosea goes after his woman over and over, even when she returns to her sins. He never stops loving her, and takes care of her. Along those lines, Noah from Snow Angel (by Jamie Carie) stole my heart. He, too, is a man that pursues and protects. As much as a human can, he offers unconditional love. And what a sweet man! Well, I'm sure there are many more that I could choose, but now it's your turn! Any readers out there want to share some of their favorite fictional heroes and why you like them? The latest poll results are in! The question was: Of the following, which is the part you like best about spring? I think the fact that "Newborn animals" was the top result is fitting. Isn't that what spring is all about? Spring entails new life and new hope. 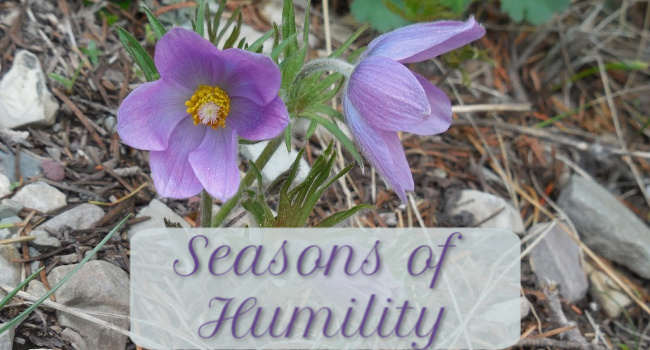 In the "Seasons of Humility," spring is the time when we really feel alive in the promises of God. He knows what is best for us, and though it's hard to let go, to release the old (our own desires) and wait patiently for God's will, when spring comes we see the wonder of trusting in God. He can do good through us, but we have to submit to His will. And what joy the spring brings! The beauty (like the flowers), the new life (like newborn animals), the warm comfort (like sunny days), and the fresh start (like cleaning out the old to make room for the new). Only God could work such miracles and offer such delights, such hope. Embrace it! God does not let us down. Trust Him and let go. Spring is in the air! Quick reminder: If you haven't taken a look yet, I recently interviewed author Leanna Ellis and her responses are so thoughtful and fun! Just scroll down or click "author interview" in the Labels section. I just finished reading Once in a Blue Moon in the wee hours of the morning. And I now have my interview questions ready, if you wouldn't mind taking the time to answer them for my blog. Thank you so very much! Hi, Amber! I’m happy to answer a few questions for you. Fire away! What is your favorite part about living in Texas? Was it fun to write a book mostly set in your home state? Probably my favorite part of living in Texas is being near family. My parents have always lived within a couple of hours drive, and now that my father has passed away I’m close enough to help my mother if she needs it. My sister lives even closer, which makes me very happy, and we have her over often. Also, my nieces live in Texas but have been further away as they’ve attended college and graduate school. I long for the day when they’ll be in the Dallas/Fort Worth area. It makes it much easier to see each other on a regular basis. We are a very close family and see each other quite often throughout the year and especially on holidays. Writing about my home state is always fun and somewhat easier as I don’t have to worry with accents. But thankfully I was able to travel to Marfa to research Once in a Blue Moon. That was very useful and fun. My kids really like research trips! The easy question first: I have not seen IQ. I’ll have to try to get it sometime. Sounds fun! And for the first question: I love movies, so choosing one genre might be hard. I’m quite eclectic in my tastes and probably have several different types of movies in my favorite category. I love musicals and was pretty much raised watching things like Singing in the Rain and Brigadoon. Can you tell I love Gene Kelly? But I love romantic comedies too. My husband enjoys Cary Grant movies and so we often watch those together. I probably wouldn’t say I’m a sci-fi fan but I love Star Wars and Star Trek. I also have several westerns that I love, like True Grit or Dances with the Wolves. I love epics too. Horror is probably my least favorite. I do, however, occasionally like something like Poltergeist or The Sixth Sense. Then, of course, there are so many classics that…see! I could go on and on! And then there’s comedies! And Christmas movies are a category all by themselves…okay, I can’t seem to stop! 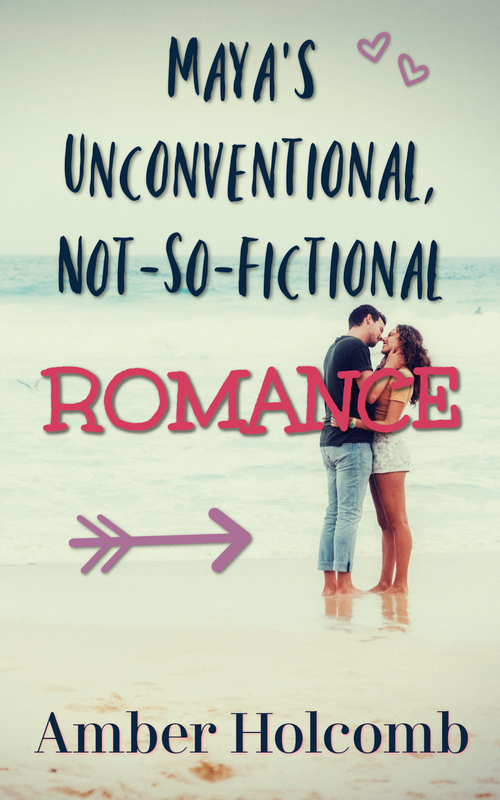 Quick Note: If you love romantic comedies, you'd love IQ! It stars Meg Ryan and Tim Robbins (with Walter Matthau as Einstein!). It is such a fun, sweet movie, and I know you'd love it, Leanna! How much research goes into a book like Once in a Blue Moon? Did you actually take a glider ride to feel what it was like? Make a trip to Washington D.C.? I did get to go to Washington D.C. I had been there a couple of times before but my memory of specifics was sketchy at best and needed refreshing. I’m glad we went and were able to take the kids. It’s such a fascinating place. My kids favorite place was the Spy Museum. Very cool. I did not take a glider ride mostly because I’m chicken but also a total wimp with movement. I often get ill on rollercoaster rides. But I talked to several people who had been on gliders or who owned them and that was very helpful. Are the places described in Marfa (such as the observatory, the soda shop, etc.) real or at least based off of real places? Did you ever go to the Marfa Lights Festival? The MacDonald Observatory is very real and a wonderful place to visit. The hotel in Marfa is very real and has all the Giant memorabilia and a lovely patio and fountain as I describe in the book. Many of the places in the book are either real or based on a real place. Howard’s place is made up, as is Sam’s and the glider hanger. But a lot of gliders to operate out of that area. When we went to Marfa, it was during the Marfa Lights Festival. Because we decided to go on the spur of the moment, we had to get a hotel room over an hour away. But I’m so glad we went, and so glad we went at the beginning of writing that book and not after the fact as I changed a few things in the book based on our visit. What was your inspiration for writing such an intriguing story? An article about an obituary writer caught my attention and imagination, and I wondered what it would be like for a writer to have written their first obit for someone they loved. And then in my crazy brain a seed took root and the story started to grow. With Ruby’s Slippers, I thought, what would happen if Dorothy lost her somewhere over the rainbow? Another seed! I’m always asking myself questions like that and some seeds take root, others not. I think if you know what Men in Black is then you’re good but it isn’t necessary to see it. If you want to see the movie, that would be fun but it won’t give you any hidden meanings. It isn’t as intricately woven with Once in a Blue Moon as the Wizard of Oz was with Ruby’s Slippers. Last summer a gal came up to me and said she’d read Ruby’s Slippers and enjoyed it. But she’d never seen the movie! I was delighted to know that the story could be enjoyed on its own merit without prior knowledge. Because of my book she rented the movie. I do try to make my stories accessible to all whether you’re familiar with the pop culture aspects or not. Thank you again! Thank you, Amber, for having me here today, for reading Once in a Blue Moon and providing a review of it! I appreciate that! Thank you so much Leanna for taking the time to answer my questions and for visiting my blog! Leanna can be found at the following website: http://www.leannaellis.com/home.html. And readers, if you'd like to read my review for this great book, click on this link (or just scroll down to the following post): http://seasonsofhumility.blogspot.com/2010/04/my-review-of-once-in-blue-moon.html. "Bryn Seymour was nine years old when her mother died under mysterious circumstances on the same day Apollo 11 made its historic lunar landing. Forty years later—divorced, working as an obituary writer, and duly cynical—she meets Howard, a conspiracy theorist who knew her mom and believes a small Texas town may hold clues to what really fueled her demise. Seeking closure, Bryn goes along for this men-in-black ride. But upon meeting Howard’s son Sam, an outspoken Christian, she can’t decide whose beliefs are more pie-in-the-sky. The gravity of life has pulled Bryn down for decades. But a perfect love could be her first step to soaring. It only happens once in a blue moon." This is a well-written and engaging book! There were several times I had to laugh out loud at Ellis' clever choice of words as well as her interesting cast of characters. Reading Sam's comment that "preachers like to kiss" was just one of many laughable moments. But what I really appreciate was Ellis' ability to weave together both sorrow and humor in such a way as to make the characters real. The dialogue seemed very natural, including the questions asked by Bryn when she's seeking answers on matters of faith. On that note, I have to say I don't necessarily agree with everything in the book. Not to say that any material was offensive; rather, it was more that I wasn't sure that I agreed with all of Sam's beliefs (or how he worded them) or actions. However, a result of this was that it really caused me to ponder what Sam said and did, and to consider what it is I believe on certain subjects. And for that, I say bravo to Leanna Ellis! Overall, this was an enjoyable read. Intrigue really adds a lot to this book, and that sense of mystery doesn't even end when the book does! But to find out more about that, you'll have to read the book for yourself! I had someone help me draw a name and the winner is . . . Ariel! Congratulations! Be looking for my e-mail, Ariel! Thank you to all those who entered the drawing, and to all those who left comments! It was fun hearing about your Easter memories. This week, be looking for my review of Once in a Blue Moon, and (hopefully!) an interview with the author, Leanna Ellis. Also, don't forget to take a look at the new poll posted in the sidebar! On Saturdays, I would like to share something with you that will hopefully make you smile and brighten your day, even if just a little bit! These two pictures were taken last night before heading to an all-girls dance at another dorm. My friends are so wonderful, and so much fun! From left to right: my fabulous roomie (Lindsay), Novela and Annie (roommates), and Brenna (our amazing RA!). Aren't they adorable? Novela and Annie won the "twins" competition--no surprise there! Change is expressed so well in the seasons: spring, summer, fall, and winter. Each season has its own unique characteristics, and while some may not be our favorites, they all have their hardships and their own unique beauty. Each season of our life is a reminder that God is at work, and that their is hope when we trust in God. After winter comes spring. After summer comes fall. While we are in this world marked by time, seasons will continue on in their cycle. But someday, we will no longer be living in this world, and (if we believe in Jesus and are saved by grace) we will live with God forever--eternal life, beyond the constraints of time! While this is only based off of nine people's responses, I believe it's interesting (but not surprising!) that many people favor spring and summer over fall and winter. We enjoy those warm, hopeful, blossoming months. And isn't it interesting that my rating scale for reviewing (see the sidebar) follows the same pattern? Fancy that! Hopefully this poll helps you see how my rating scale works! I'll be posting a new poll soon (in the sidebar), and I'll try to connect what the poll is about to a post that I write, so take a look if you're interested! Also, exciting news!!! I have been communicating with several different authors, and because of their kindness I plan on having two author interviews for you in the next couple of weeks! And the summer should offer some excitement, as well! I'll let you know more later, but I thought I would give you a taste of some fun coming up soon! "Hope Bartolli has avoided Sisters for years—both her hometown of Sisters, Oregon, and her two sisters who live there. But when the thirty-two-year-old corporate lawyer returns home to attend her beloved grandmother’s funeral, she’s surprised to learn that she has inherited Nona’s old house, her little dog, Andy, and an unexpected friendship with Nona’s handsome attorney. If she had any hopes of burying the hatchet with her sisters, these “gifts” from Nona aren’t going to help. Hope wants more out of life—but is she willing to take the risks to get it? And can she trust her family to stand by her side?" This book was a fun read! And I'm not just talking about the laughable quotes, such as, "And was it just her imagination or could he pass for George Clooney's younger brother?" The sweet dog Andy, the helpful and trusting niece and nephew, and a handsome and compassionate attorney all made me smile. Melody Carlson really made these characters feel real, so much so that it was easy to be both angry with and have compassion on certain characters, such as Hope's sisters. The issues that were dealt with in the book were real: divorce, jealousy, anger, pain, love, etc. And many of the attitudes toward these issues (such as divorce) seemed contemporary. That is to say, for example, divorce was treated as something that is shocking when it is happening to people you know and love, but also as something that happens quite often. I appreciated the fact that the author did not shy away from these issues, even if it did seem like a lot was going on to this poor family! And yet, the author showed elements of love that does not judge, but rather shows care and understanding. It is a good lesson to express to readers. All in all, while the book was not heart-pounding, it turned out to be a sweet romance with some surprising lessons taught about family. And while I did not feel that the language was overly beautiful in the sense that it really resonated with me, I truly did enjoy my time reading this! The author did a great job of making the characters and their lives real to me, and for that I have no qualms with recommending this book! This is a video I made to the song "Job" by Huckleberry Flint. It is a beautiful song, and I see it as a reminder to consider one's perspective on life. The pictures are ones that I took on family vacation in Oregon last summer. I hope you enjoy the video, and may it remind you of God's goodness and mercy! How wonderful, how marvelous, are those words! Jesus is risen! And in Him we have hope! As for the title of this post, I thought it appropriate on such a grand occasion (as well as to celebrate the beginning of my blog) to have a giveaway for my readers! 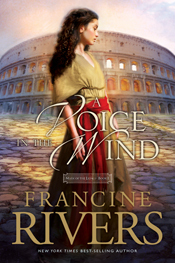 I have a new copy of A Voice in the Wind by Francine Rivers to give away to one lucky reader! "This classic series has inspired nearly 2 million readers. Both loyal fans and new readers will want the latest edition of this beloved series. This edition includes a foreword from the publisher, a preface from Francine Rivers and discussion questions suitable for personal and group use. #1 A Voice in the Wind: This first book in the classic best-selling Mark of the Lion series brings readers back to the first century and introduces them to a character they will never forget--Hadassah. Torn by her love for a handsome aristocrat, a young slave girl clings to her faith in the living God for deliverance from the forces of decadent Rome." 1. 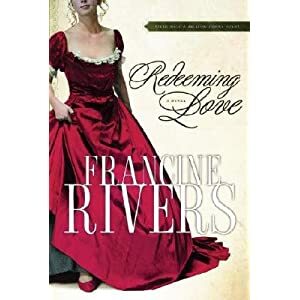 What is your favorite Francine Rivers novel? If you have not read any of her books yet, which book of hers might you be interested in? Entries into the drawing will be accepted through Sunday, April 11. The winner will be announced on Monday, April 12. Good luck to everyone, and have a wonderful day! Today is the day we commemorate the greatest sacrifice ever made. Today is the day we commemorate the love so great of a God so good, who sent His only Son to die so that He could offer grace to a sinful world. Today is the day we commemorate the pain and agony Christ suffered in order to provide a way--the only way--to be close to God, to have a relationship with Him. Although today is the day set aside to remember Jesus' crucifixion, it should not be the only day we remember. How many times have I been guilty of taking my salvation for granted? Every day of my life should be a witness to the hope Jesus' death and resurrection gives me. In this hymnal 1 John 5:4 is cited along with this hymn. I'd like to share 1 John 5:4-5. In Jesus, we are victorious! Our lives should reflect that wonderful news every day. And because Jesus rose again, we have more than enough reason to live joyfully and look heavenward, for He is coming again! And because of God's grace, we can go home to be with Him forever. Now that is news worth sharing and living out daily! So as you go throughout your day and all the days to come, remember the victory Jesus won for us-- a victory we don't deserve, but one for which we can be eternally grateful.